Two can get comfortable and cozy thanks to the plush padding of the arms, seat, and back of this loveseat. The frame is constructed of hardwood and plywood and features Poly Plush cushions for a functional, durable place to relax. Infuse style into your room with the square exposed wood legs of this loveseat. Sit back and sink in, fashion and ease have been taken care of with this loveseat. The 3684 Stationary Loveseat with Pillow-Top Arms & Exposed Wood Legs by United Furniture Industries at Household Furniture in the El Paso & Horizon City, TX area. Product availability may vary. Contact us for the most current availability on this product. Arm Pillow top arms used. Leg or Skirt This collection features exposed wood square legs. Frame Construction Each piece is constructed of hardwood and plywood frames. Padding & Ergonomics Each piece incorporates sinuous wire springs and foam or Poly Plush cushions for comfortable seating your can enjoy, durability you can depend on, and functionality you expect. Take time from your busy life to relax on 3684, a collection of comfy and casual upholstered furniture. Each piece is constructed of hardwood and plywood frames and features Poly Plush cushions for satisfying seating you can enjoy, durability you can depend on, and functionality you expect. 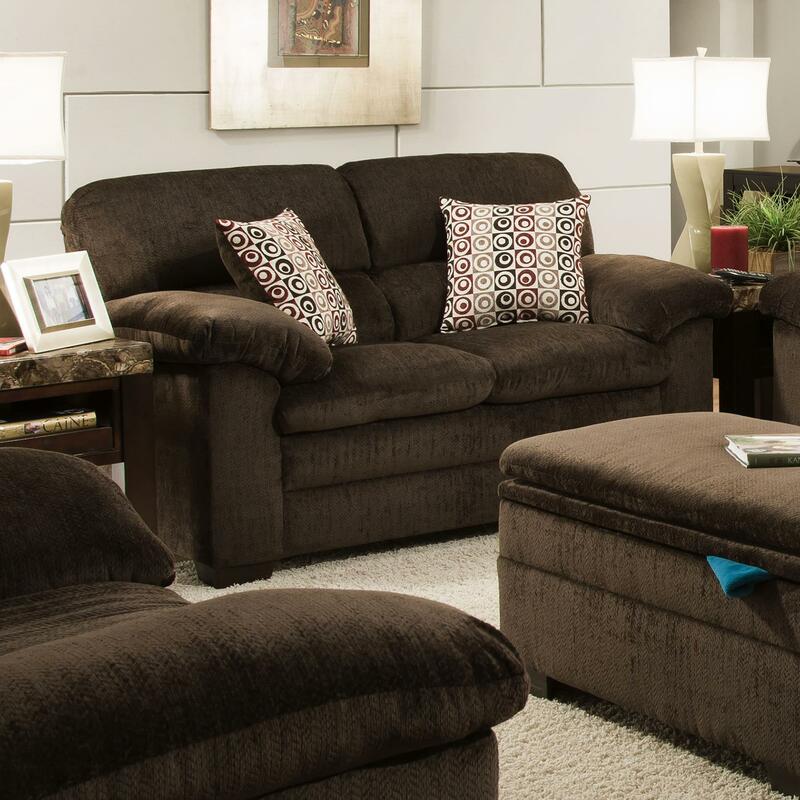 The stationary sofa and loveseat of this collection are relaxing and stylish with pillow-top arms, square exposed wood legs, and three fabric color options. For casual style and complete comfort, you will want your home to include 3684. The 3684 collection is a great option if you are looking for Casual furniture in the El Paso & Horizon City, TX area. Browse other items in the 3684 collection from Household Furniture in the El Paso & Horizon City, TX area.